Two weeks after the Catalonian local government held a referendum on independence, deemed illegal by the Spanish courts, government, and the international community, and boycotted by the opposition, the “struggle” for Catalonian independence has degenerated into farce. Catalonia’s “President”, Carles Puigdemont, has surfaced in Brussels where EU officials refuse to meet with him, the Belgian government denies inviting him, and where a planned press conference provided no enlightenment on his future plans. Back in Catalonia, the government he presided over has been dissolved by the Spanish government, with Spain’s deputy Prime Minister assigned to govern the region until new elections scheduled for December. It is unclear if Puigdemont or his allies will take part. Despite proud declarations of defiance, and a vote for independence passed with the support of the same 70 out of 135 members who had backed the referendum, the Spanish takeover proceeded uneventfully. Six Ministers joined their leader in Belgium, while the streets were filled by unionist protestors. Nationalists were quick to allege that protestors had been bussed in from other regions of Spain, but what was more striking, as it was the weekend of the referendum, was not the ability of the unionists to get supporters into the streets of Barcelona, but the absolute failure of the nationalists to do so. Catalan independence seems not to exist outside the chambers of the now suspended local government. Some of this is due to the decisive actions of the Spanish government and the unified front presented by the international community, but an equally, if not more important factor, has been the vacillation and incompetence of Puigdemont and his followers. The declaration of independence did not follow the “referendum”, but rather was a belated response to the suspension of Catalan autonomy more than a week later, by which time it was clear that Madrid’s actions would neither be resisted by the Catalan populace, or by their leaders. The “referendum” itself was followed by……virtually nothing. The Catalan government spent the following day trying to rally international outrage against the actions of the Spanish police on the day of the vote, and arguing that the vote was merely the basis for “talks” with Madrid. Outrage over the “brutality” of the Spanish police seemed to exist almost entirely in the international press. Few protests were held, and there was no sign of a strike. In fact, it was the unionists who managed to pull off a show of strength with a rally in the heart of Barcelona. Had the Catalan government called its supporters into the streets in outrage over the actions of the Spanish police, and made a declaration of secession, they at least might have thrown Madrid off-guard and raised the costs of any forceful action. Instead, by indicating that they had no strategy or plan for what should follow the referendum, the Spanish government of Mariano Rajoy gained confidence, and even the luxury of time for their own response. With it clear that there was no prospect of quick action on the part of the Catalan government, Madrid was free to show patience of their own, requesting a clarification from Puigdemont as to whether he had in fact declared independence or not. This placed the Catalan leader in an impossible position. Rather than making demands of Madrid, Madrid was making demands of him, and turning him into a figure of mockery for good measure. A clarification that “independence” had been declared would have been a confession of cowardice and ineffectualism, while denying one had been made would have been a humiliating surrender. Unsurprisingly, Puigdemont chose the option of asking for further talks while not clarifying his own governments actions, position or intentions. Having thoroughly confused his own supporters, both domestically and internationally, it cost little for Madrid to suspend his government and even risk new elections, apparently convinced that Unionists could actually win. 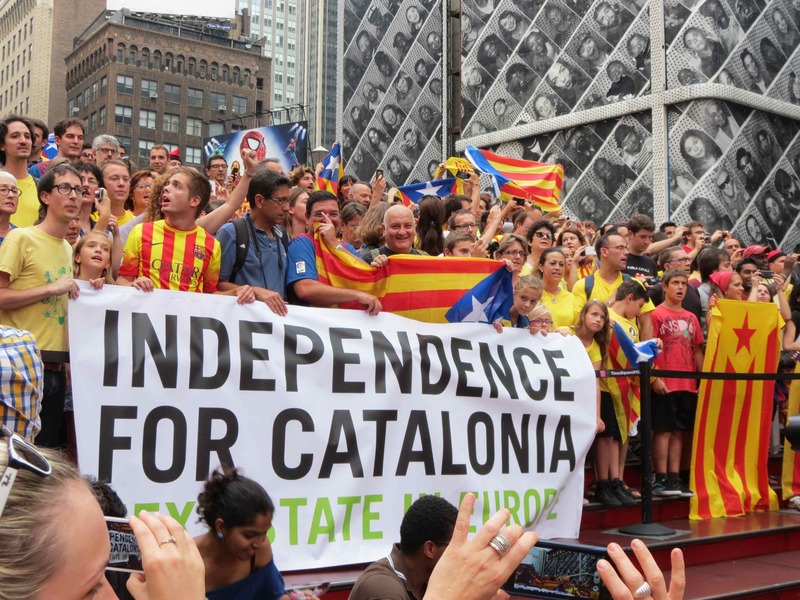 The belated declaration of independence then was an admission that the Catalan nationalists had blundered, demoralizing their own supporters, and undermining their political position, perhaps fatally. It was a far too late effort to rally Catalan nationalists and establish the local leaders as martyrs which should have occurred the day after the referendum. That the Catalan politicians did not even remain at their posts in order to undergo arrest undermined whatever good the move could have done. This story is not the one seen in many parts of the English language press, where Madrid is seen as having blundered by using excessive force. But if there was in fact a backlash against Madrid in Catalonia, it seems likely the Spanish government would have delayed new elections for most of the six months allowed under Article 155 of the Spanish Constitution. Instead, by scheduling new elections in December, Madrid indicated the opposite belief, that the Catalan separatists have politically crippled themselves, and that the sooner elections are held, the more certain the Unionist triumph. That the Catalan separatist leaders, rather than sitting in prison as martyrs or rallying supporters are holding farcical press conferences for the foreign media suggests Rajoy and his government have a better read on Catalan political sentiment than the Guardian or far too many American and British backseat commentators. That they have been going back and forth on whether to participate indicates a lack of confidence in the prospects of success. In fact, Rajoy seems so certain that if he turns out to be wrong, he may well lose Catalonia. By scheduling an election so soon, it would be hard to see a situation in which a separatist triumph in December did not force Madrid to talk seriously about secession. It would raise the alternative prospect of indefinite emergency rule and non-stop elections, something that would see the rapid erosion of International support for Madrid. As such, it is hard to see this as a risk Madrid would take unless there was a strong belief in victory.